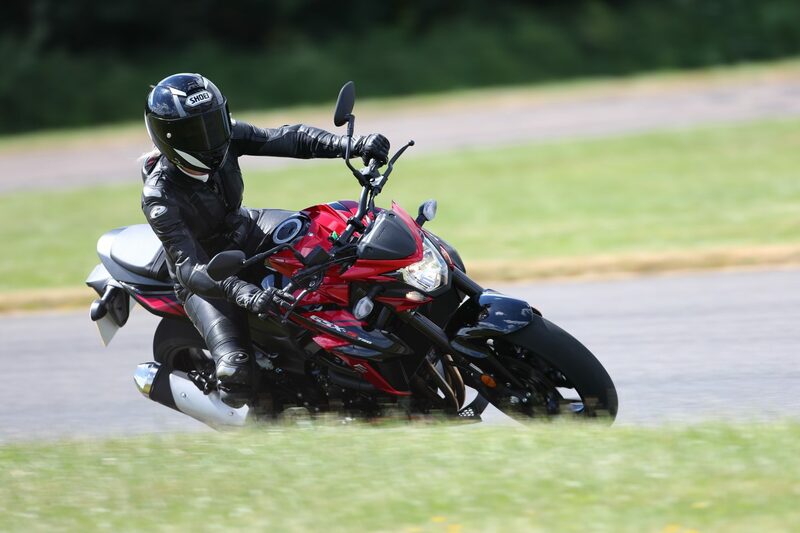 On the 21st June 2018, I somehow managed to wrangle a spot at Suzuki’s Media Day, an event held at Bruntingthrope Aerodrome and Proving Ground. For those who have never been, Bruntingthorpe Aerodrome and Proving Ground is a privately owned airport near the village of Bruntingthorpe, Leicestershire. 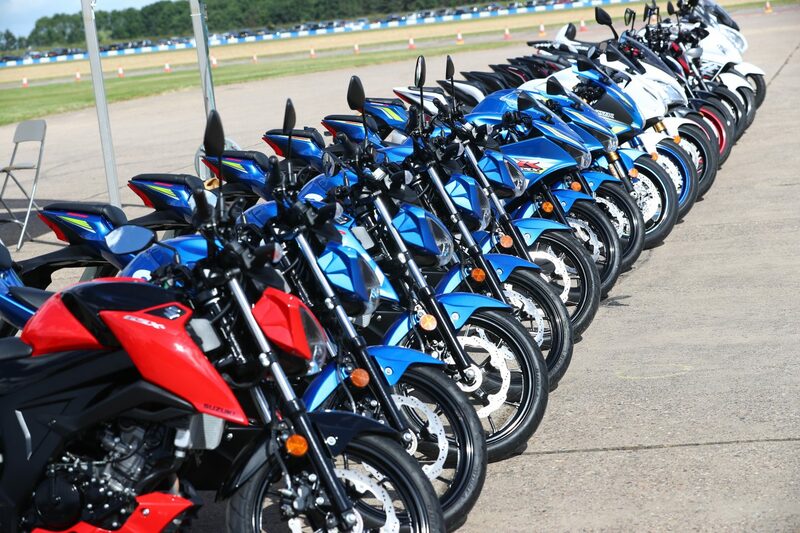 I arrived to see a line up of 10 models from Suzuki’s 2018 range standing there before me. 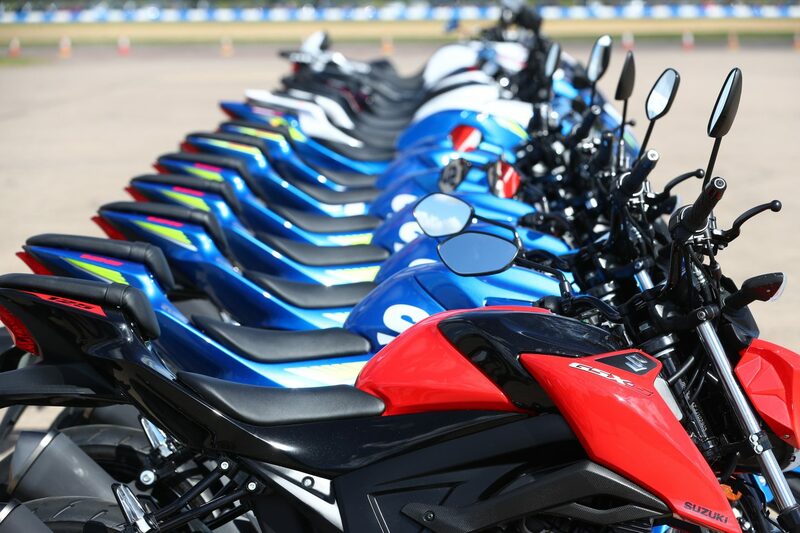 A stunning line up of bikes combined with an open pit lane on an airfield on a beautifully sunny day could only mean one thing… a day filled with spring boarding onto different bikes and riding flat out! Excuse the hair… It was windy! When we rocked up, we had some breakfast (fruit and pastries) and a brew, because can you really start the day right without a brew? No, absolutely not! As more bloggers, social media hustlers, photographers and journalists arrived, you could feel the excitement building, especially when we were all told to gather round for the morning brief. The line up in all its glory! The day was designed to be laid back, no pressure, no super strict regime – just jump on the machines and enjoy! From 125cc all the way up to 1300cc! 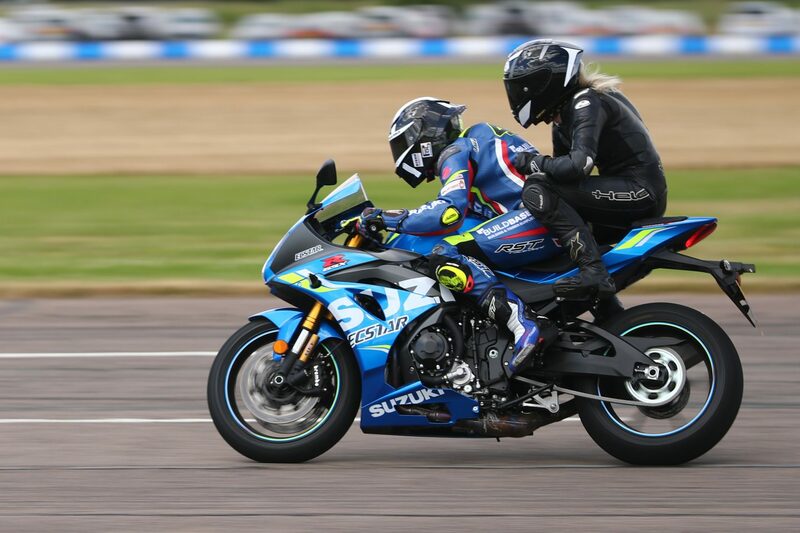 The first bike that I rode was the GSX-S 125, whilst my partner in crime Jen took out the GSX-R 125. The GSX-S is the naked version with flat bars and a striped down look, where as the GSX-R is the sporty version with clips ons and fairing. The 125’s got their very own playground, a go cart track offset from the main air strip, so that’s where we took em! I had some fun chasing Jen on there, who was dragging her knee everywhere. When we rocked back up to the main area, some bikes were already out on track being ridden, so I jumped on what was available and gave it a whirl! 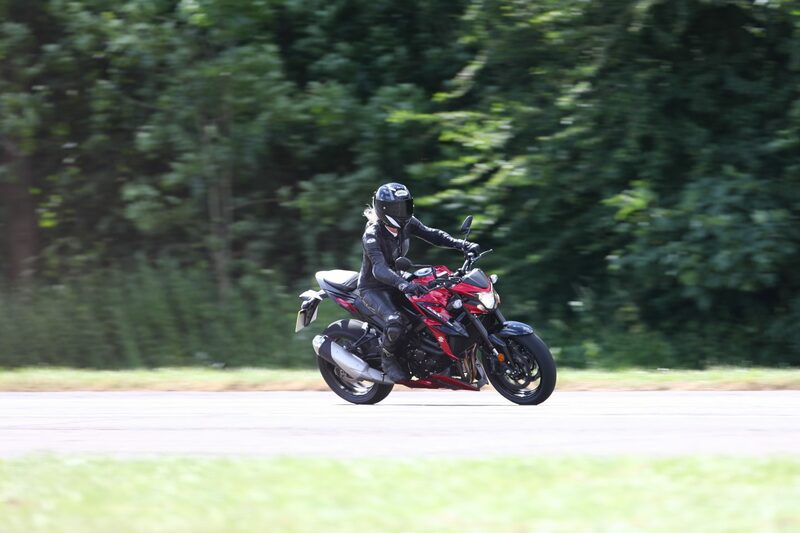 There was a nice GSX-S1000 free so I decided to ride it! 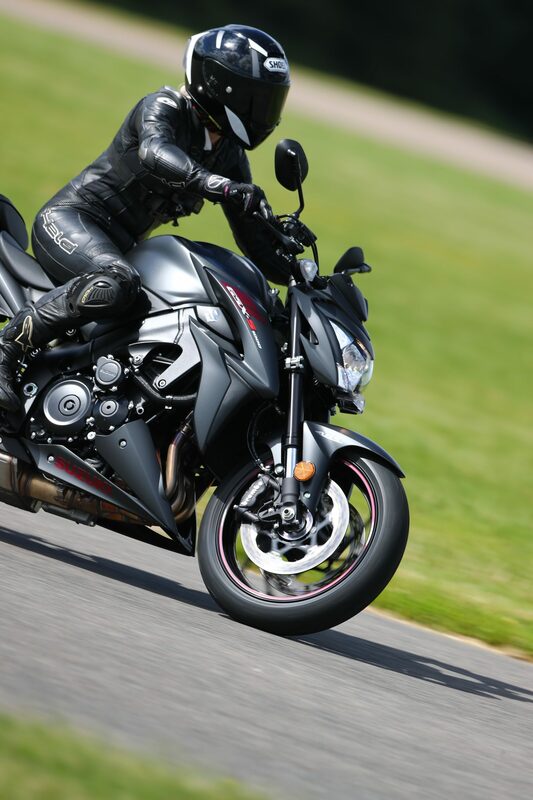 My first impression of the GSX-S1000, was that it felt extremely flick-able and agile. The riding position was extremely comfortable. 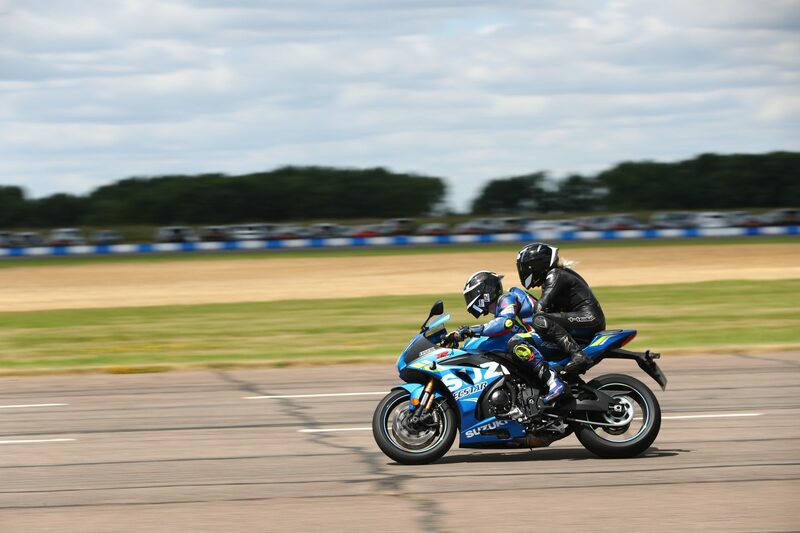 The only thing I slightly struggled with was not having a screen when doing speeds in excess of 120 mph, as I’m only a small creature – so clinging on for dear life was a bit of a challenge! 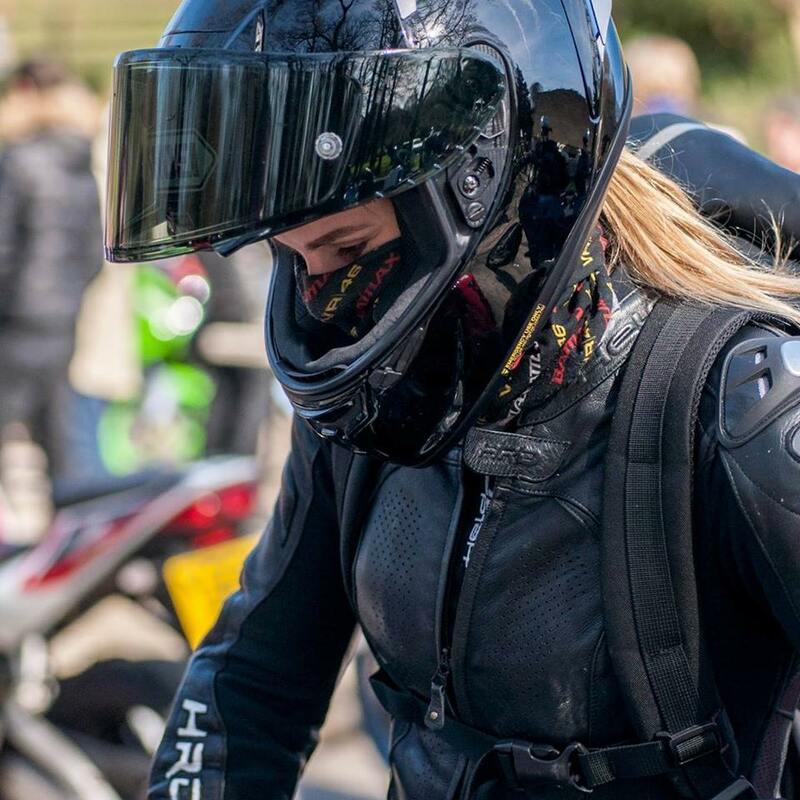 On a normal days riding where the max speed limit on a motorway is 70 mph (Mr officer)… the lack of screen wouldn’t have been an issue for me I’m sure! 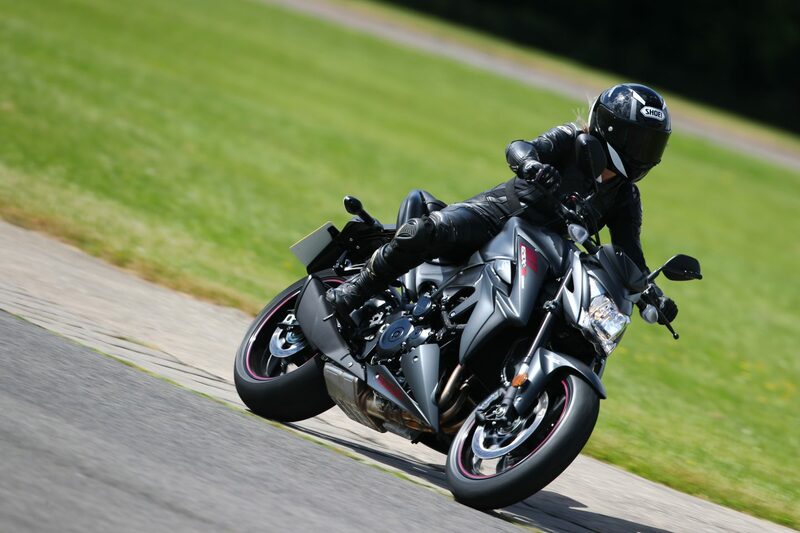 The front brake is extremely keen, which caught me off guard as I wasn’t expecting it to be keener than the GSX-S1000’s front brake. Overall, I was really impressed with the GSX-S range and I’d love to try them out on the roads as well as a track environment. 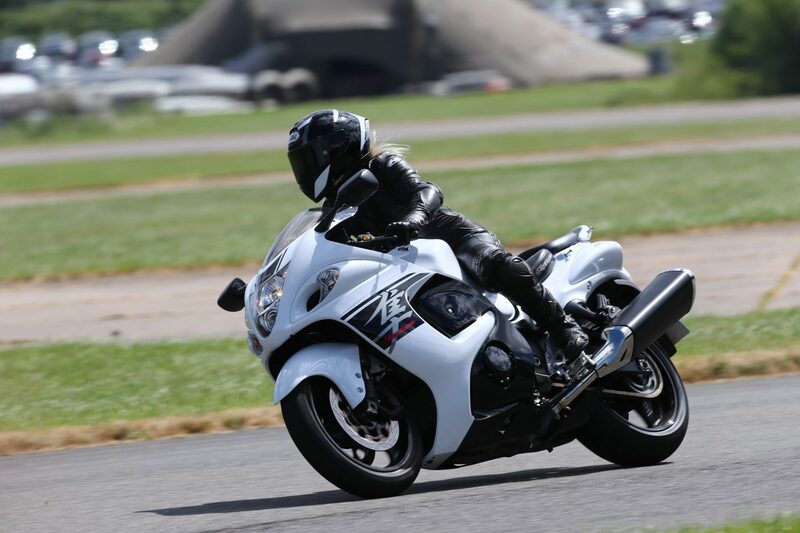 I was starting to get a feel for this jumping on new bikes malarkey so I thought next, I’d give the Hayabusa a try! When I saw the Busa at the start of the day, I had big dreams to gain entry into the elite 200 mph club, however that dream was short lived; as the stretch of straight track wasn’t long enough to achieve this mission! Not to mention modern bikes are usually limited to 189 mph by manufacturers. 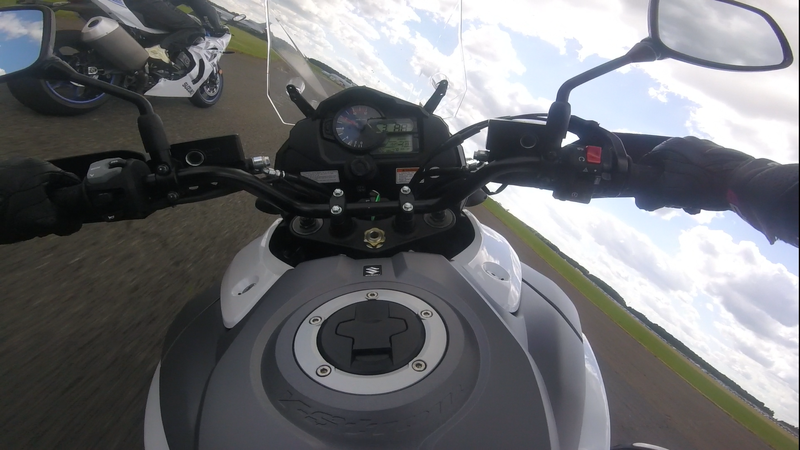 Still, I managed to hit 160 mph a few times on the Busa but couldn’t go any quicker as you lose your bottle when you approach the next corner at eye watering speed! Visually, everything about this bike is old school. If you were to put a 1999 Hayabusa next to this one, you’ll see only slight changes, but that all contributes to its charm. Feature wise, there have been advancements with Brembo calipers for ultimate stopping power, lightweight ABS and more horses, what’s not to love? As you can see from the above chest cam image, the dash is still extremely retro, the Hayabusa’s dash remains analog whilst the GSX-R1000R got a fancy, new, multi functional LCD dash for 2018. I’m not mad about this, as it’s all in-keeping with the heritage of Suzuki’s Hayabusa. 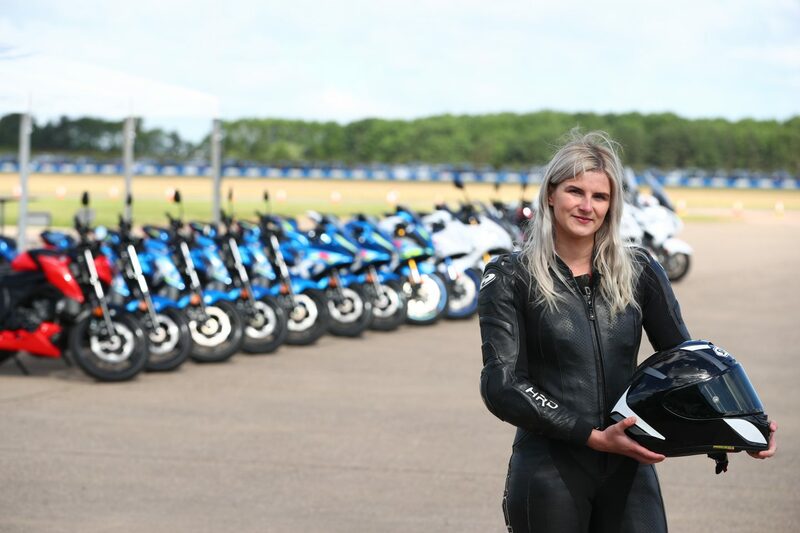 Obviously I didn’t ride these bikes enough to give you a full review, these are just my initial thoughts, what I will say about the Busa though, is that it feels like a rocket propelled couch. Its super comfy which i’d imagine would be pleasant for touring but with heaps of power and the brakes necessary to stop it, it’s also an absolute weapon. I must say, I thought it stopped exceptionally well for the speeds it was doing! Which is always reassuring. It was the bike that surprised me the most with how planted and stable yet agile it felt, and it ended up being one of my favourite bikes of the day! 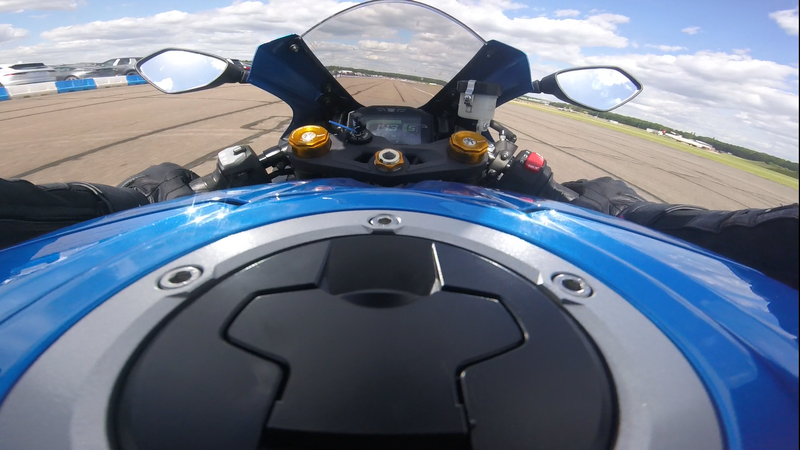 The next bike I decided to play on was the GSX-R1000R. I had been excited for this since the early morning but it was an extremely popular choice for riders on the day and there was 2 of them to share between 15 of us. The quick shifter up and down is as smooth as slug snot. I was impressed. The only thing I found a little odd at first was there was no definite clunk when your foot alters the gear shifter. Most people wouldn’t have an issue you with this and find it completely normal, which it is! I am just used to a agricultural ‘clunk’ from the shifter so I know it has changed gear. Don’t get me wrong, I like to feel a seamless response from the engine but I like tangible feedback from the shifter, which I found soft and unsure if i’d shifted. From the look of the standard exhaust, you would not expect it to sound aggressive like it did! It sounded dirty shifting through the box! Yea, yea, yea we’ve seen the reviews on this bike, we’ve read the mainly negative opinions about the looks of the exhaust, but if you have a bike and dont upgrade your exhaust instantly, are you even a biker? HA. It’s the same with a standard reg plate hanger as well, everyone has their grumbles about them but as soon as they get home, they stick a tail tidy straight in their online basket! As you can see by the chest cam shot above, the LCD dash is quite nice! It’s not as fancy as some TFT dashes I’ve seen, HOWEVER everything is clear to view including your speed, gear, revs, traction control setting and it’s pleasant to look at. 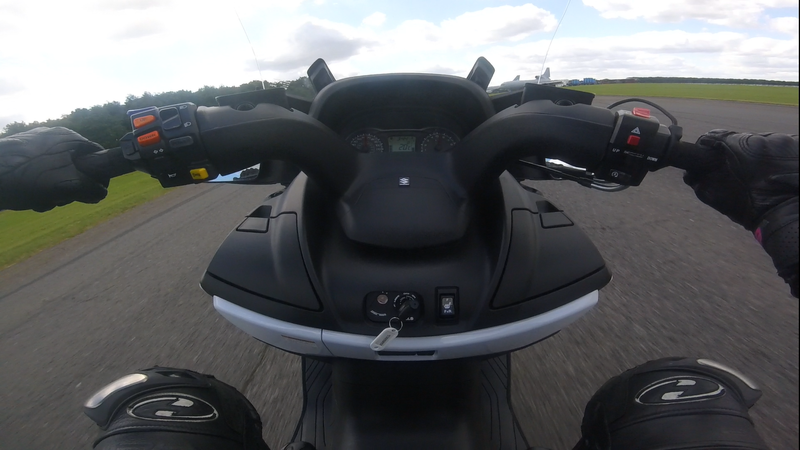 This is when I stepped onto the mighty Burgman 650. A gaint, comfy rev and rip automatic scoot (that does have a manual mode whereby you can change gears via a switch on the bars). Out of all the bikes available, I was most nervous to try this machine! Why? The last time I rode a scooter was 11 years ago. 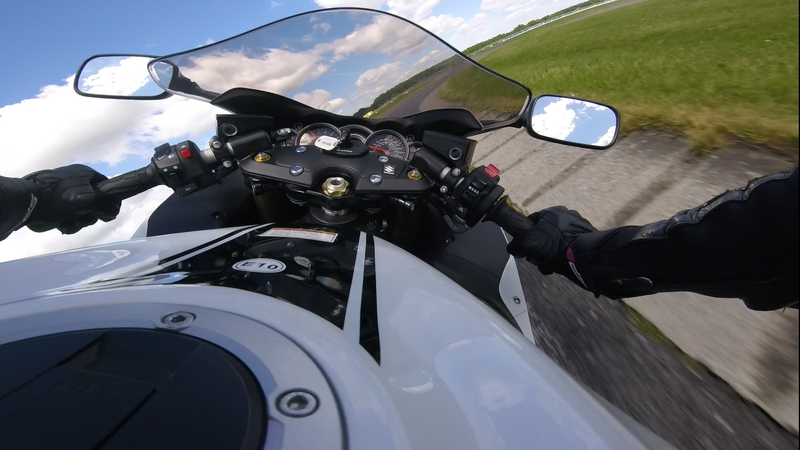 After giving myself an extra moment to remember DO NOT GRAB A HAND FULL OF CLUTCH, as its a brake, I was good to go! The Burgman 650 has a power mode believe it or not so you can release its inner beast. It also has a hand brake, heaps of under seat storage, an adjustable screen, heated seats and electric mirrors, to me it felt like the ultimate commute scoot. 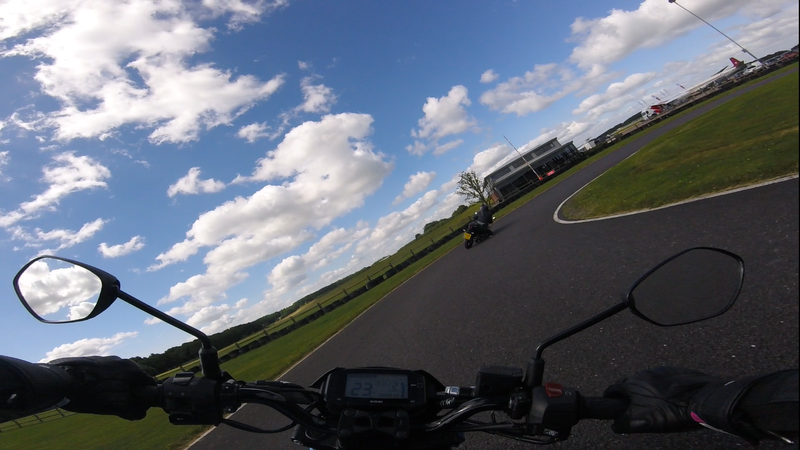 Taking it on the track was quite funny as you can hit lean angles that you wouldn’t normally attempt on the roads. I will tell you, you can lean it quite a bit before the centre stand scrapes! It felt a little strange riding a Burgman in one piece leathers and a Shoei race lid! Moving on to the second bike that I was a little anxious to try… The V-Strom 1000XT. Why? I’ve never ridden an adventure bike before. They’re so tall so it always put me off – being 5’4 and 9 stone wet through. As soon as I set off, all my worries were left behind. Its comfy, quick and very smooth. I really enjoyed it. 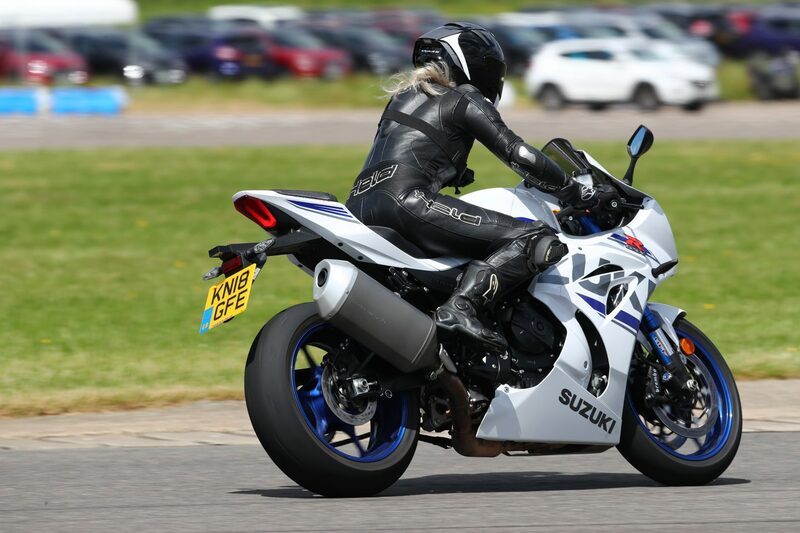 I even managed to do a GSX-R1000R on the outside, which left me smiling inside my lid and impressed with the power of the motorised armchair I was sat upon! After riding every bike I could (except the GSX-S1000F as it was the end of the day and there was no fuel left for it), the day was finished off in the most spectacular way! He was on the GSX-R1000R with nothing but a ratchet strap tied around his waist. So I clung on and tried not to fall off! All in all, I had a fantastic day! I got to broaden my horizons and ride different bikes other than what I am used to and I met a whole bunch of amazing people in the process. 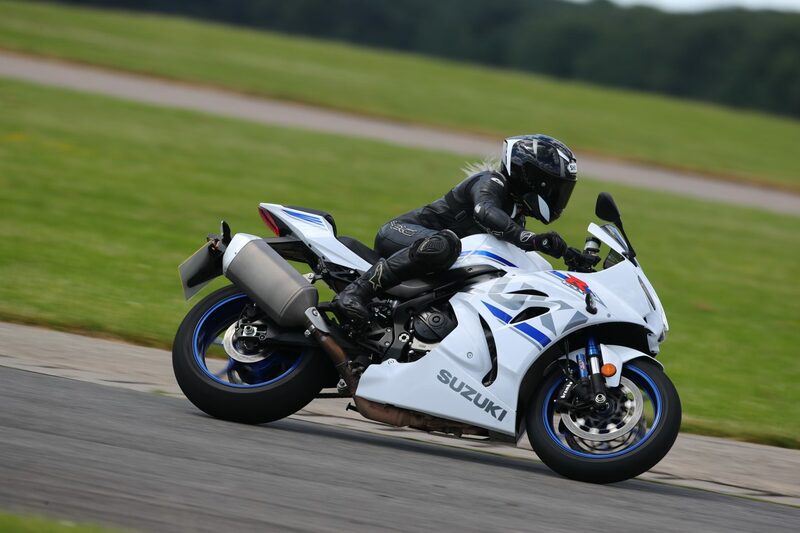 Thank you Suzuki UK for letting me attend!